Background: Older patients often have multiple comorbidities and are susceptible to develop intercurrent diseases during rehabilitation. 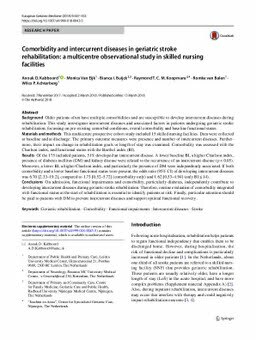 This study investigates intercurrent diseases and associated factors in patients undergoing geriatric stroke rehabilitation, focussing on pre-existing comorbid conditions, overall comorbidity and baseline functional status. Materials and methods: This multicentre prospective cohort study included 15 skilled nursing facilities. Data were collected at baseline and at discharge. The primary outcome measures were presence and number of intercurrent diseases. Furthermore, their impact on change in rehabilitation goals or length of stay was examined. Comorbidity was assessed with the Charlson index, and functional status with the Barthel index (BI). Results: Of the 175 included patients, 51% developed an intercurrent disease. A lower baseline BI, a higher Charlson index, presence of diabetes mellitus (DM) and kidney disease were related to the occurrence of an intercurrent disease (p < 0.05). Moreover, a lower BI, a higher Charlson index, and particularly the presence of DM were independently associated. If both comorbidity and a lower baseline functional status were present, the odds ratio (95% CI) of developing intercurrent diseases was 6.70 [2.33–19.2], compared to 1.73 [0.52–5.72] (comorbidity only) and 1.62 [0.53–4.94] (only BI ≤ 14). Conclusions: On admission, functional impairments and comorbidity, particularly diabetes, independently contribute to developing intercurrent diseases during geriatric stroke rehabilitation. Therefore, routine evaluation of comorbidity integrated with functional status at the start of rehabilitation is essential to identify patients at risk. Finally, particular attention should be paid to patients with DM to prevent intercurrent diseases and support optimal functional recovery.